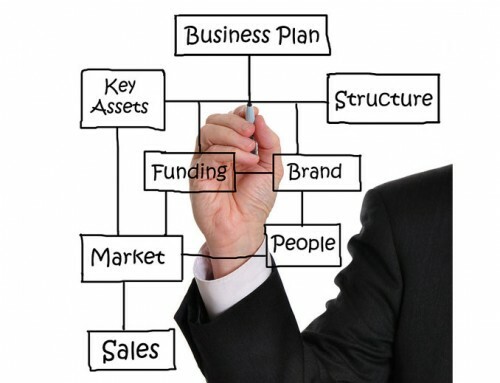 Business Analysis Tools for SME Business Owners. Not every business owner has the means or desire to hire a Business Consultant or Business Advisor. 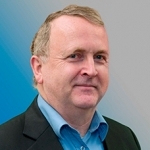 So what should a business owner do if he wants to get a good understanding of how his business is performing, particularly in relation to how it is performing compared to other businesses? Well a good place to start, is to find out what business analysis tools for SME business owners are useful and readily available. 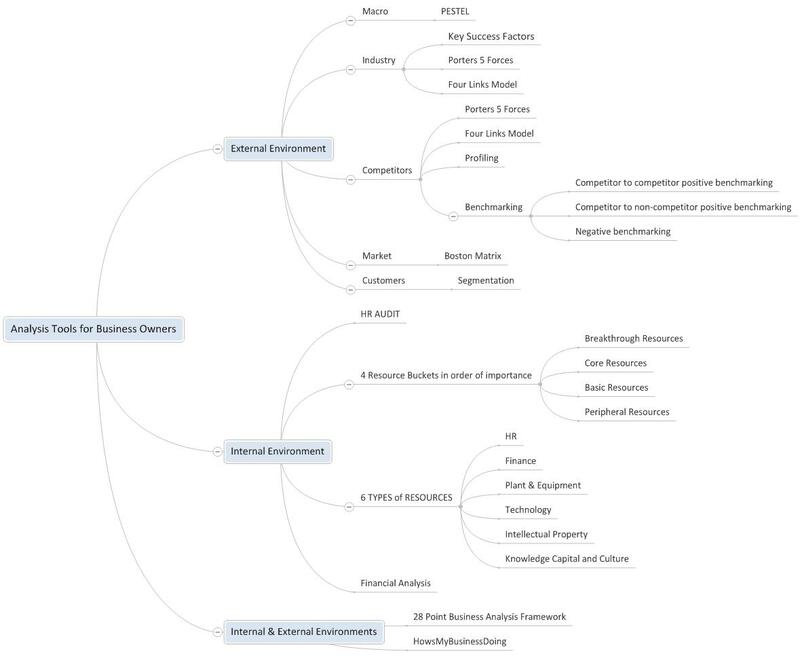 The image below shows a model of the typical business analysis tools that can easily be used by SME business owners. It can look a little bit intimidating at first but don’t get anxious about all the different options. You don’t have to do them all and you can chose the ones that are most appropriate for your business, before giving a few of them a try. The various tools are separated into those for use in the External Environment (outside your business), Internal Environment (inside your business), and a hybrid, which can be used to analyze both internal and external environments. The idea behind a PESTEL analysis is for you to use your own general knowledge to assess the impact of each of the six drivers on you and your business. If you don’t read the newspapers or watch the daily news, you may need to get some outside help to guide you through this exercise. Otherwise, you should be able to master the tool simply by asking yourself a bunch of questions in each category. For example, in examining Political Drivers, you need to ask yourself questions about elections, consumer protection, industry-specific regulations, competitive regulations, inter-country relationships/attitudes, war, terrorism, political trends, governmental leadership, taxes, and government structures. The questions should be based on the impact of these things on your business and your industry. A similar approach should be taken in relation to the other 5 drivers within this framework. Detailed explanations of each Driver can be found on the Internet. 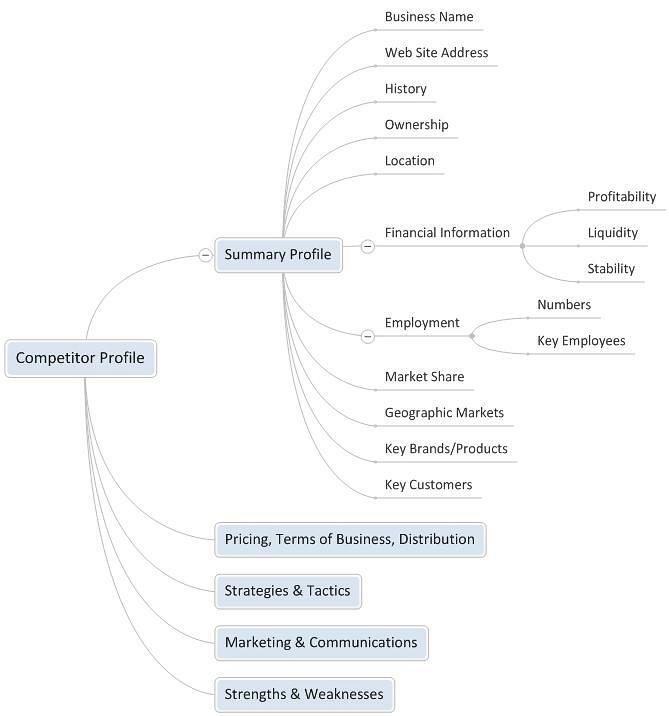 Now let us take a look at industry and competitor analysis tools, some of which fit into both camps. Key Success Factors are attributes or benchmarks that every business in a given industry must achieve in order to survive in that particular industry. Essentially, a KSF is the minimum standard required to allow a business to participate in an industry. It may be something like having a license to trade in the industry, such as a real estate license. 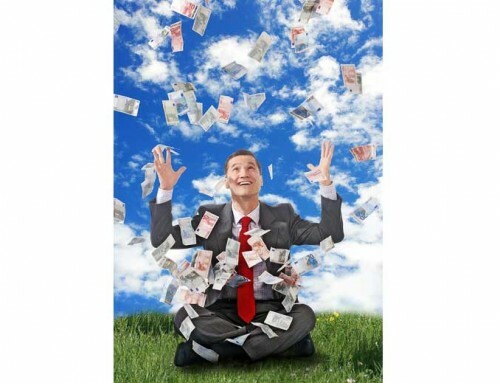 It might be a certain skills set or financial structure in a different industry. The SME business owner needs to look at the successful participants in his industry and identify what they have in common. Then he needs to look at his own business and see if he meets the minimum standards or KSF’s for his industry or niche. Is there high or low competitiveness in your industry? Are the barriers to new entrants high or low? Are the threats of substitution products high or low? Is the bargaining power of buyers high or low? Is the bargaining power of sellers high or low? A more refined set of questions to ask yourself about your industry is shown in the Porter’s 5 Forces image below. The challenge for you is to determine where the market power lies in your industry and how it may impact your business. The Four Links Model looks at the opportunity for collaboration in your industry, as opposed to the rivalry discussed in Porter’s model above. It is made up of 5 elements with you or your business at the center. 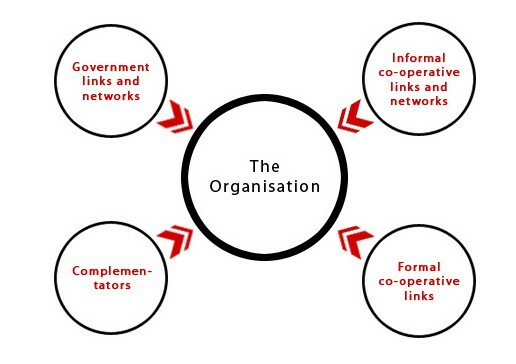 The 4 surrounding elements are: Government, Formal Links, Informal Links and Complementators. The idea behind using this model is to identify resources that you can tap into in each of the outer circles, which will allow you to leverage them for your own benefit. This is particularly beneficial for smaller businesses with limited internal resources. 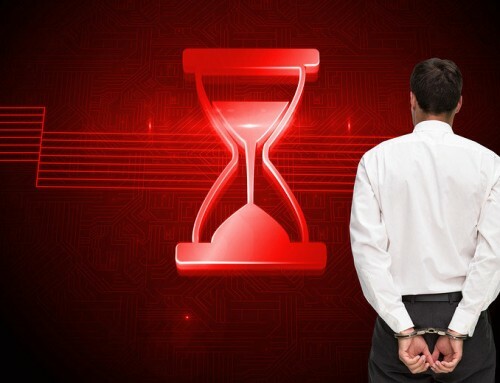 If you consider Government links and networks, you need to examine if Government agencies or networks exist that would be willing to help your business in any way. Formal links tend to be legally binding and include joint ventures, strategic alliances, sharing board memberships and affiliate marketing. Informal links might be industry associations and Chambers of Commerce. Complementators tend to be other businesses joining with you to co-brand product offerings. An example of the latter would be airline loyalty groups such as Star Alliance ore One World. Profiling involves taking a detailed look at your competitors and measuring them across as wide a range of attributes as you can come up with. If you use the same set of attributes to measure each of your competitors, then you can compare the best against the worst performers. The image below gives a sample approach you might consider. Branches should be expanded to reflect the specific attributes you want to measure. 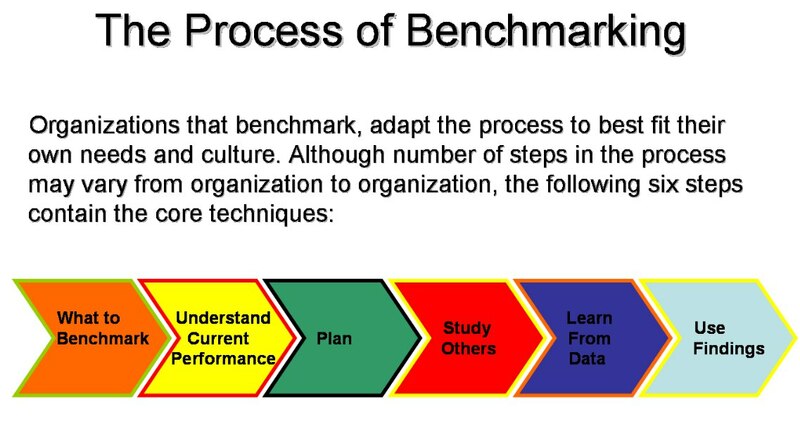 The purpose of benchmarking is primarily to understand what best business practices are being used by competitors and non-competitors so that you can copy and improve upon such business practices and leapfrog the competition. This can then be translated into competitive advantage for your business. HowsMyBusinessDoing is an example of an automated business analysis and benchmarking tool that carries out Competitor to Non-Competitor Benchmarking for small and medium businesses, and consequently obviates the need for SME business owners to carry out the benchmarking themselves. A market analysis studies the attractiveness and the dynamics of a special market within a special market. It forms part of an industry analysis. The goal of a market analysis is to determine the attractiveness of a market, both now and in the future. 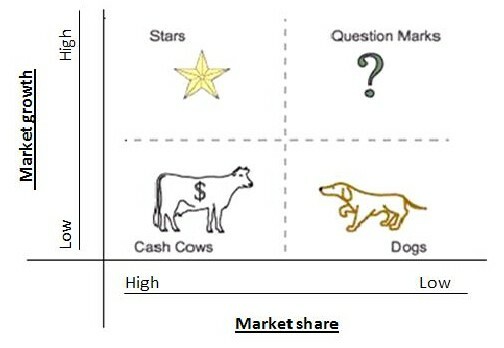 One tool commonly used to measure the attractiveness of a market is known as the Boston Matrix. It looks at products and their stage in the product life cycle and helps SME Businesses to understand which of 4 categories their products currently fall into. Typically, new products start in the top right quadrant, Question Marks, and they may be promising but their future is undetermined. Unsuccessful products will drop away and disappear but successful products will cycle into the top left quadrant, Rising Stars, when the product is at breakeven or better and ascending. The next step in the cycle is the bottom left quadrant, Cash Cows, wherein the products are at the peak of their earning capacity. Finally, products inevitably move into the bottom right quadrant, Dogs, wherein earnings are dropping and the product will eventually die or be discontinued. Market Segmentation is a process whereby a business decides to divide its broad target market into subsets of buyers with common attributes and buying behaviors. These may be Geographic, Demographic, Behavioral, Psychographic, Cultural, or a combination of these. 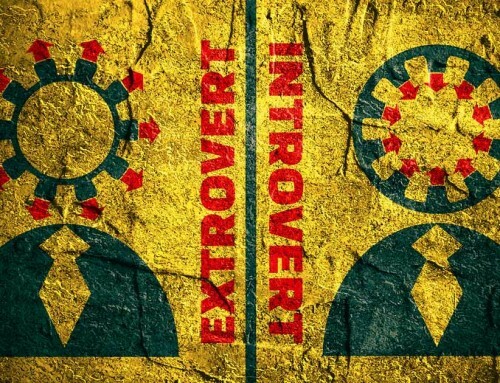 These defined groups tend to behave like tribes based on their common needs or attributes. The more segmented the group is, the better chance a business will have to maximize its margins when selling to the group. Now let us move over to examining the Internal Environment. The first tool we will look at is a HR Audit. A Human Resources Audit is a comprehensive and systematic method used to to review current human resources policies, procedures, documentation and systems to identify needs for improvement and enhancement of the HR function as well as to assess compliance with constantly changing rules, regulations and employment legislation. The Audit usually involves systematically reviewing all aspects of human resources in a checklist fashion. The purpose of an HR Audit is to recognize strengths and identify any needs for improvement in the human resources function. A properly executed Audit will reveal problem areas and provide recommendations and suggestions to address these problems. In line with emergent or Agile Strategy, some firms see their competitive advantage evolving from the way in which they run their internal environment, or culture, rather than focusing on the external competitive environment. For example, firms like Apple and Google concentrate on getting everything right internally (most of the time) and they are market makers rather than market takers. They are of the view that culture promotes experimentation and divergence, which is good for the business. The alternative to this is a process focus that some people say promotes standardization and conformity. 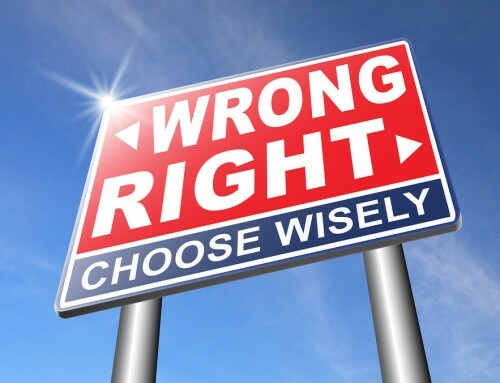 This is not to say that one way is right and that the other way is wrong. It is simply a different way to view the business environment. 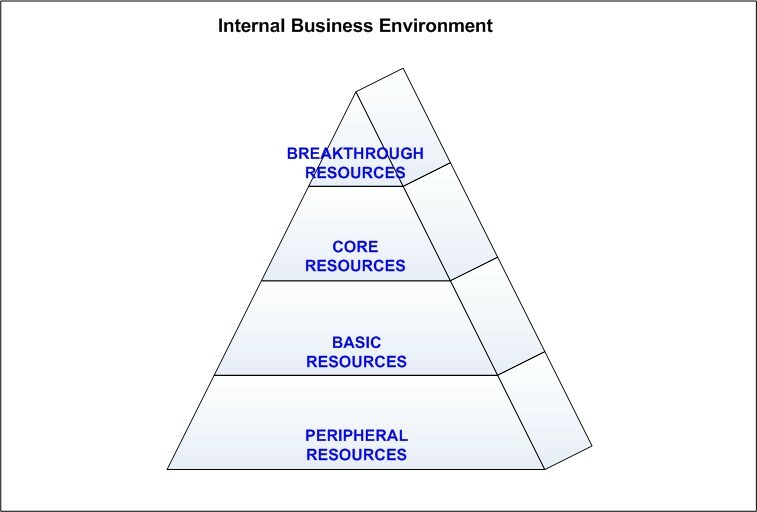 One way of looking at this, which I simply call 4 Resource Buckets, is to divide your resources into 4 main groups – Breakthrough; Core; Basic; and Peripheral. Breakthrough Resources, or innovators, don’t follow a linear process of research followed by planning followed by launch. They pursue iterative cycles of design, release, evaluate, improve or discontinue. Breakthrough resources are at the heart of your business and sit at the top of your agile hierarchy. Next comes Core Resources, which are next in importance in your resources structure. Then comes Basic Resources, which tend to be administrative in nature. Finally, there is Peripheral Resources and these can often be viewed as discretionary. The most interesting part of this model is the fact that the typical tangible resource types that we are all familiar with get superimposed on this model. These 6 Types of Resources are HR, Finance, Plant & Equipment, Technology, Intellectual Property and Knowledge Capital/Culture. Different businesses will have different configurations. Some businesses may have most of their breakthrough resources in Finance whereas others may place Finance in the Basic Resources category. Similarly, some businesses will place Technology into Peripheral Resources whereas others will view Technology as Breakthrough. This model helps you to understand the specific configuration of your resources and how important they are for your business. Financial Analysis is used to track the historic performance of a business over time so that the business owners/managers can identify trends arising in the business. There are lots of different models available and it is possible for a reasonably competent Excel user to create their own analysis model. It is recommended that at a minimum, the model will identify trends and ratios for Profitability, Stability, Liquidity and Cash Flow Cover. I include one such Excel model in my eBook – “How to Carry Out a Health Check on Your Business” and it is also delivered as part of HowsMyBusinessDoing business analysis software. 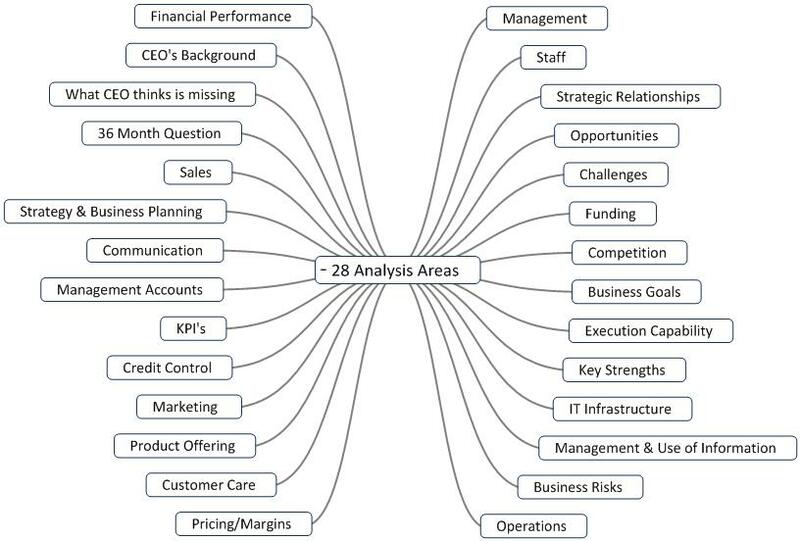 The final analysis tools are the 28 Point Business Analysis Framework and HowsMyBusinessDoing. 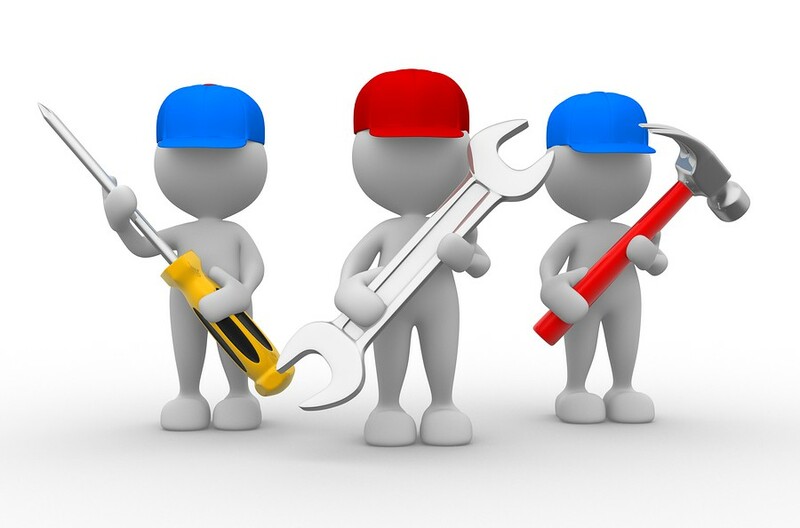 These are considered hybrid tools because they cover both the internal environment and the internal environment. If you want to do it alone, the 28 core analysis areas are identified below. You simply need to ask yourself how each of the core functional areas are performing. 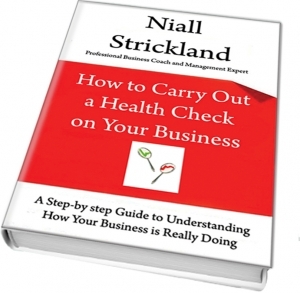 My eBook – “How to Carry Out a Health Check on Your Business” provides a template for analyzing each of the 28 functional areas of your business and prompts readers to consider about 250 questions, which are pertinent for getting under the skin of your business. HowsMyBusinessDoing poses approximately 300 questions and analyzes your answers and measures them against observed best business practices. The output is a 50+ page report and a series of recommendations that will be pertinent for your business. These hybrid tools are completely optional but they do take a lot of the hard work out of analyzing your business. Just to recap on the main thrust of this article, it is not necessary for you to hire a management consultant or business advisor if you are prepared to use some or all of the tools discussed here. If you are prepared to take time out to work on your business, as opposed to working in your business, then you will undoubtedly learn many useful things about your internal business environment and the external business environment within which it operates. 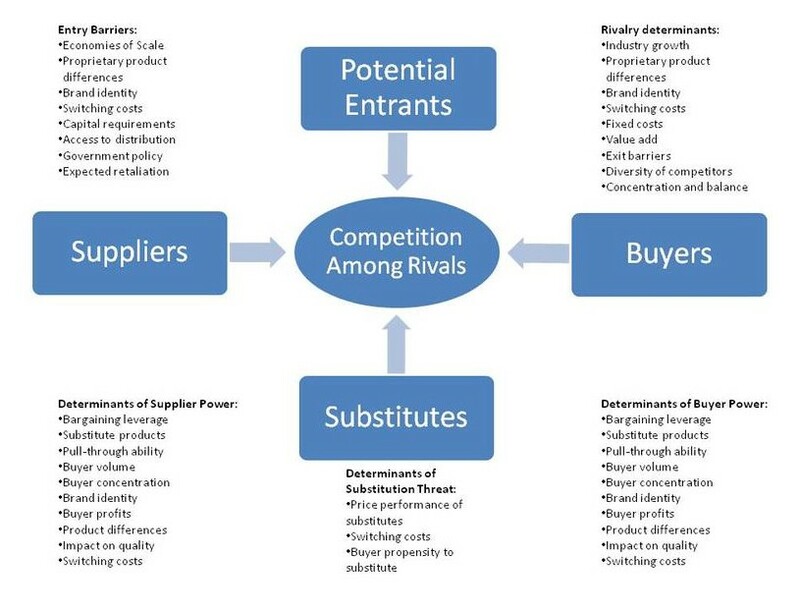 This is how you can gradually build sustainable competitive advantage. If you would prefer to hire a management consultant or business advisor to do the analysis for you, then you should perhaps take a look at one of the other blog articles on this website entitled “What does a management consultant or business advisor actually do?” It might help you to choose the right one.